After over 10 years of living here in the south Puget Sound area, I am so surprised that I have never spent more time in the Hood Canal region of the Puget Sound. It’s just a little over an hour’s drive from the Tacoma area (2 hours from the Seattle area) but once you get past the freeways & onto the little highways heading to the Hood Canal, you can almost feel the pace of life just slow down & become more relaxed as you drive along through these tiny towns found along the waters of the Hood Canal. After such a busy end to the school year, it was so nice to have a few days to catch our breath and head to this laid-back area of the Northwest for a chance to unwind and spend time together as a family. The bonus was that this was the week that the weather finally decided to cooperate & summer arrived here in the Northwest, which made for picture-perfect views from every vantage point we found along the Hood Canal. 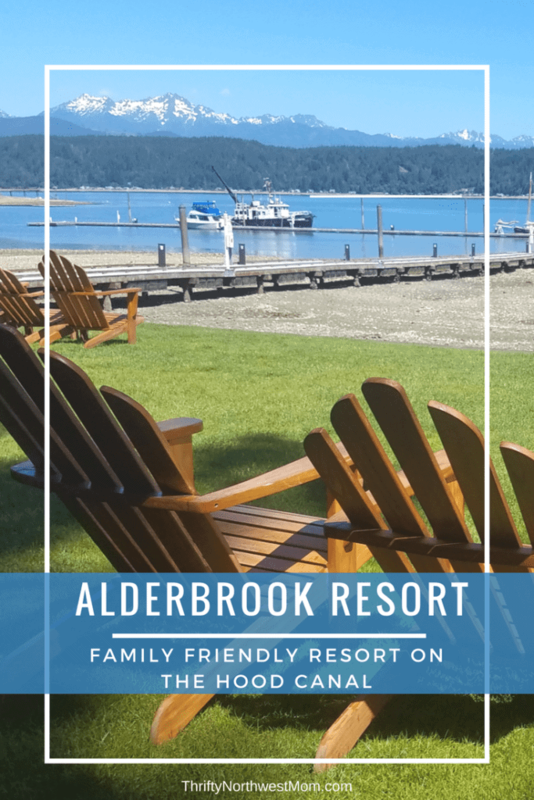 We headed to the tiny town of Union, WA, to experience what Alderbrook Resort was like as we have been asked many times over the years about resort destinations around the Northwest that families would love & Alderbrook Resort is always at the top of the list from all of you readers. We also have heard rave reviews from friends who love to take their kids, as well as head there for couples’ getaways, too, so we were excited to check it out to tell you all about it. And let me tell you – I can see why so many people have raved about Alderbrook over the years, it absolutely does not disappoint & was better than we imagined. Alderbrook Resort ranks very high up there as one of our top family-friendly resort destinations for families here in the Northwest, thanks to its unique location right on the calm waters of the end of the Hood Canal with the snow-capped Olympic mountain range in full view right across the water. 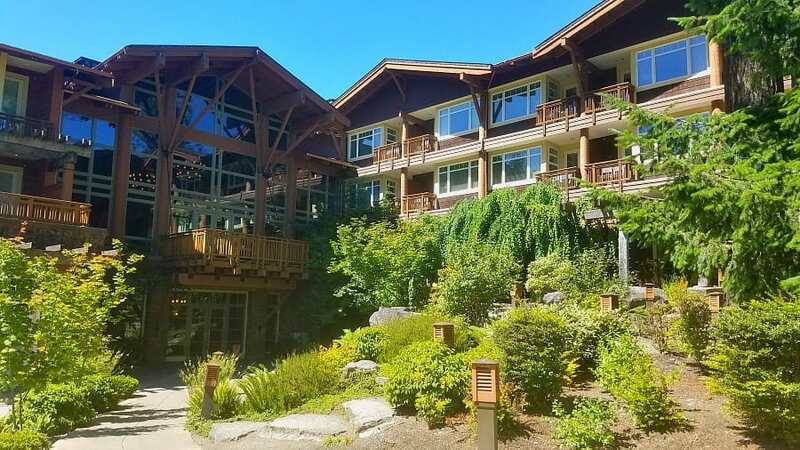 But more importantly, it is a resort that really caters to families in the activities they provide around the resort and its proximity to some great opportunities to experience the beauty of the Puget Sound region nearby. It is such a peaceful, tranquil setting that we felt that it really would have been the perfect place to getaway together as a couple or with friends, yet it still offered so much for families to do that you feel you don’t even need to leave the resort for a few days so you can slow down & experience all that it offers and just relax from the fast pace of life. 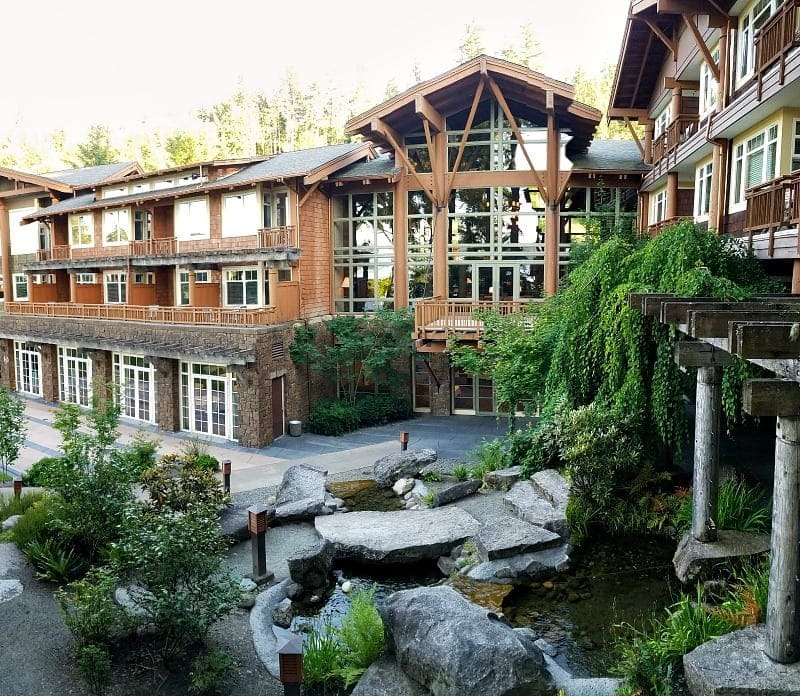 We spent two nights at Alderbrook and still feel like we had so much more to explore and enjoy so a multi-day stay is essential to really get the full experience of Alderbrook. It’s definitely somewhere you can spend quite a bit of time relaxing & enjoying all that they offer. 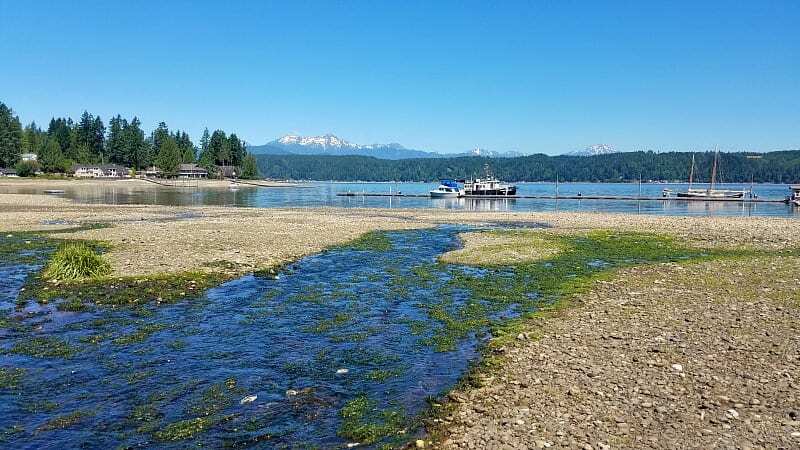 Alderbrook has a long history on the Hood Canal, with families coming to the location since 1913 and it’s understandable to see why this has been such a popular spot over the years with it’s prime Northwest location. Basically the best of both worlds with its full beach access, but then still so close to the Olympic National park & all the diverse hikes that you can find up in the mountains less than an hour away. Alderbrook offers 77 guest rooms in their resort as well as 16 cottages you can rent, with room for up to 6 people in a cottage, so it really does offer something for everyone – yet because of the smaller size of the resort, it feels so much more relaxed & intimate as you walk around the resort & take part in the activities with the other guests. The rooms are luxurious & comfortable with extra touches like bathrobes & slippers to head to the pool or a warm, wool Pendleton blanket to bring down with you if you want to sit by the water at dusk. We were so fortunate that summer decided to arrive right in time for our trip & our two days were filled with warm sunny days without a cloud in the sky, so we spent as much time as we could down by the beach & enjoying all the beautiful grounds around Alderbrook. My girls loved exploring all the sea life during low tide & we headed out on the dock where one of the marina rental employees spent so much time with my girls, educating them about all the sea life right there by the docks. 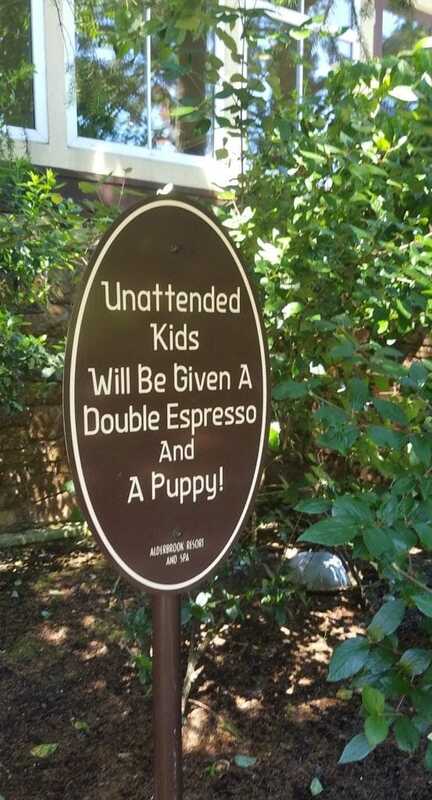 My kids begged us to leave them unattended – they really want a puppy! Ha! The setting is set up with so many opportunities for parents to sit down & enjoy the peaceful views or relax with a good book while the kids enjoy playing on the green lawn or exploring the beach. It’s one of the most relaxed I have felt at a resort in a really long time and yet my kids were always entertained and having fun, always on the lookout for wildlife or sea life or exploring new places around the resort. On our second day, we rented tandem kayaks and headed out to a nearby cove they told us about. I’ve only tried the tandem kayaking a few times, so I wasn’t sure how far I’d get us out there, but the water is so calm, that it was much easier than I thought (even with a bit of a wind). 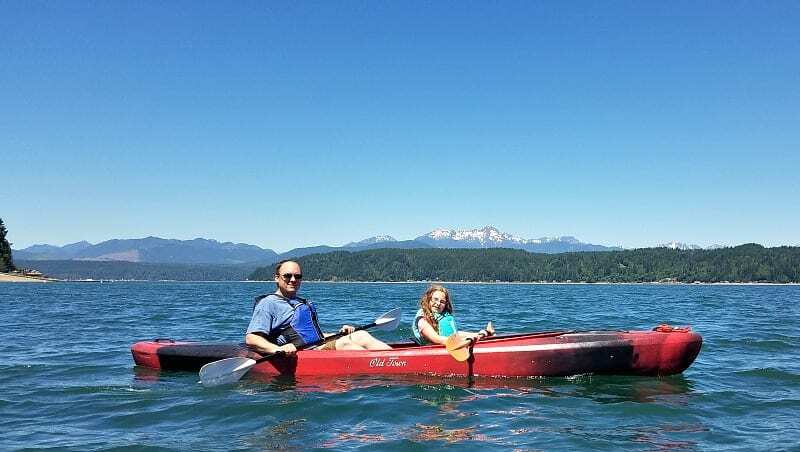 This is an experience that I highly recommend, whatever way you want to get out on the water – the peacefulness of being out on the water & the amazing views of the Olympics towering over the water, was absolutely worth it. Keep a close eye out for marine life & wildlife – we spotted a seal swimming earlier in the day, as well as 3 deer who came down to the beach for a drink, right next to the resort. So you never know what wildlife you will spot on your paddle trip or walks around the resort. All in all, Alderbrook was definitely the most relaxing resort we have been to here in the Northwest and yet full of activities for year-round fun for the kids so that everyone can feel right at home here. 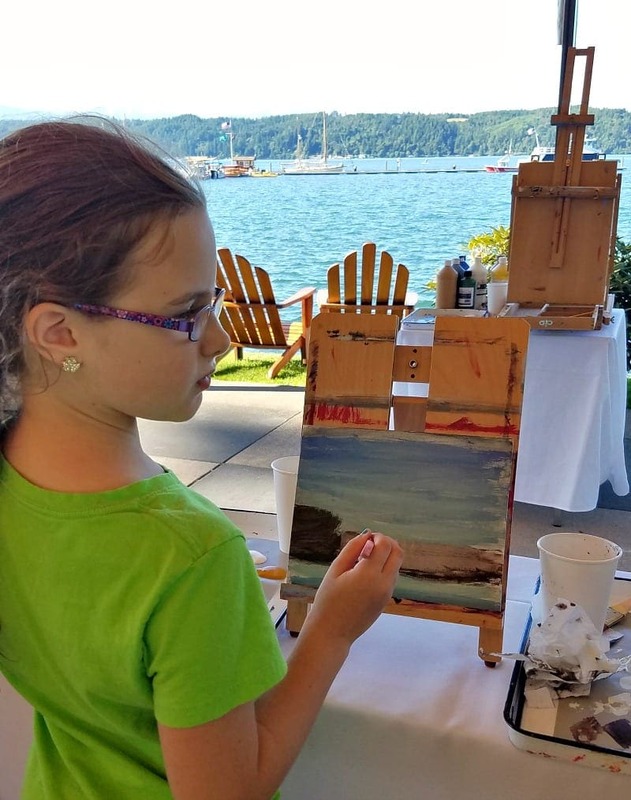 Alderbrook resort and the surrounding Hood Canal area definitely has a wealth of activities that families will enjoy during any season. Of course, the highlight of the resort is its prime location right on the Hood Canal as the water is so calm & peaceful here at the south end. But, there is still plenty to see & do even if the weather is not cooperating. If your kids love the water, whether it be swimming, beach combing or getting out in boats, then they will be in heaven at Alderbrook. 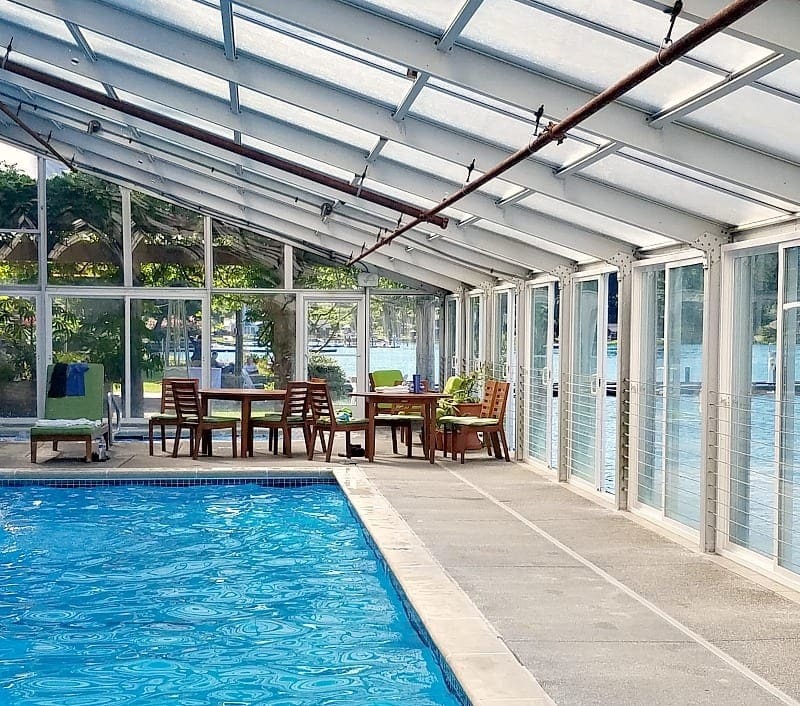 Indoor Pool – The pool is a heated, saltwater indoor pool, but what I loved about it is that it is situated literally right next to the water. Plus, a large hot tub too, which can fit a number of people without feeling crowded. When the tide is up, the water comes all the way up to the pool building and there are full floor to ceiling windows, so it is an incredible view. We spent one night at sunset swimming in the pool and hanging out in the hot tub and I couldn’t tear my eyes away from those incredible views of the water, Olympic mountains & the sun setting right behind the mountains….all of which was in full view from our vantage point in the hot tub or pool. The pool is open till midnight, too, with 9pm – midnight as adult hours, which is nice if you’re there with friends or for a couples’ getaway to have some adult time to swim or relax in the hot tub late. Beach Combing – This is an activity that could consume your kids for hours – my girls had so much fun exploring at low tide, especially as there are just so many shells, clams, oyster shells and sea life to look for at low tide. The tide goes really far out, too, so plenty of time to explore. Just make sure to bring water shoes or some sort of sandals for kids and adults to wear as it is not a sandy beach (& the shells can be sharp way out there at low tide, particularly the oysters & barnacles). I’d also recommend bringing a bucket & shovel for beach fun. 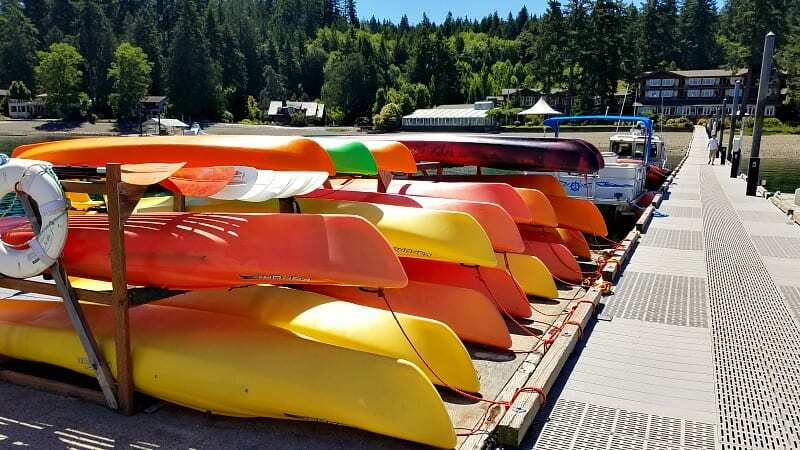 Boat Activities – There are a wide variety of boats & water rentals to get you out exploring the Hood Canal, which is a lot of fun for the kids. Prices start at $15/hr for pedal boat rentals and you can rent everything from kayaks to hydrobikes to pontoon boats & more. I can’t recommend this experience enough – whatever way you want to get out on the water will be so worth it to see those views & look for any wildlife or sealife. If you’d like to experience the beauty of the water without all the work, they also offer cruises on the Lady Alderbrook on select days with prices at just $20/person & $10 for kids. There are several other boats that offer cruises as well. Hiking – If you want some exercise but don’t want to have to leave the resort grounds by car, there are actually several little hikes that you can do that start right at the Alderbrook property. When we arrived, they gave us a map of different hikes ranging from a 1/2 mile viewpoint loop (with a bench at the top so you can sit & enjoy the view of the Olympics & water) to several 3+ mile hikes. These are perfect to take the kids out for some exercise while not having to leave the resort & you can come back for lunch or snacks when you get back. 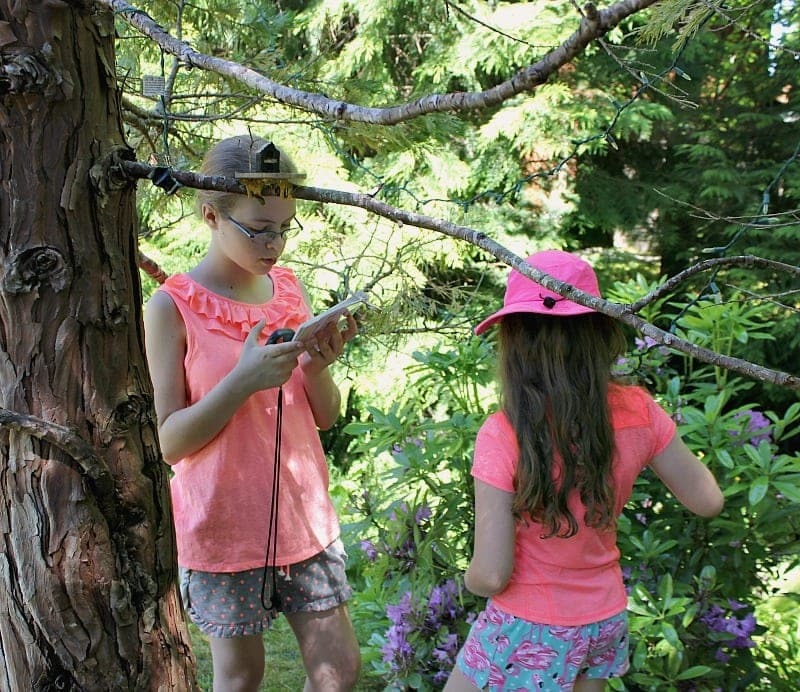 Geocaching – This turned out to be one of our family’s favorite activities at Alderbrook and this could be done any time of year. They have put together a number of geocaching sites all around their property and it’s like a treasure hunt to go & find them using the GPS device you check out from the activity desk. They actually have several different courses – we took the easy one as we’ve never tried Geocaching before, but there is another one that involved more hiking up in the trails behind the resort that we’d definitely try when we go back to visit. This is really an activity that any age would love. It’s a great way to explore the resort when you first arrive and see where everything is (I had no idea there was a playground until we did the geocaching) so I’d recommend doing this early on in your stay to acclimate yourself to where everything is around the resort. 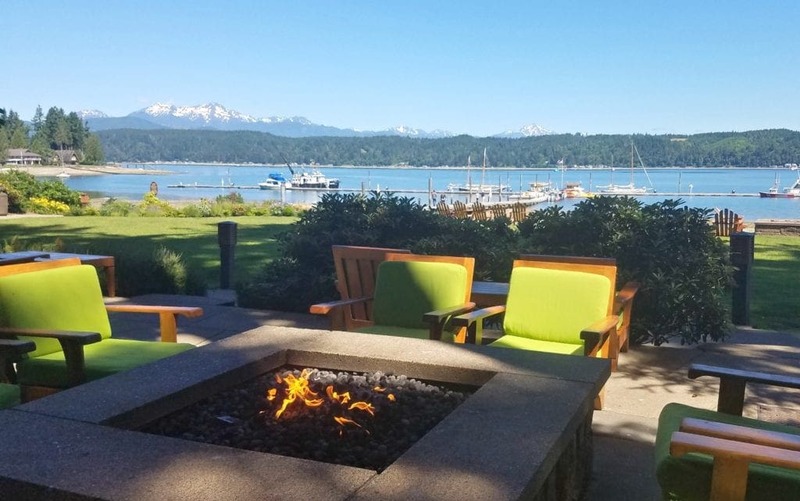 Firepits – Our favorite thing to do in the evening at Alderbrook was to head to the firepit at sunset and sit around the fire in the big adirondack chairs looking at the water and just taking it all in. They have several fire pits around the property & they will light a fire for you if it’s not already going. You can buy s’mores kits for $5 at the resort or in the restaurant or bring your own fixings for s’mores. A chance to visit with other guests & relax before heading to your room – my favorite way to unwind before bed! Golf – for those of you who like to golf, there is a golf course on site at Alderbrook. There are also several other nearby golf courses as well for you to check out. Mom or dad can take turns golfing while the other parent hangs out with the kids by the pool or beach. 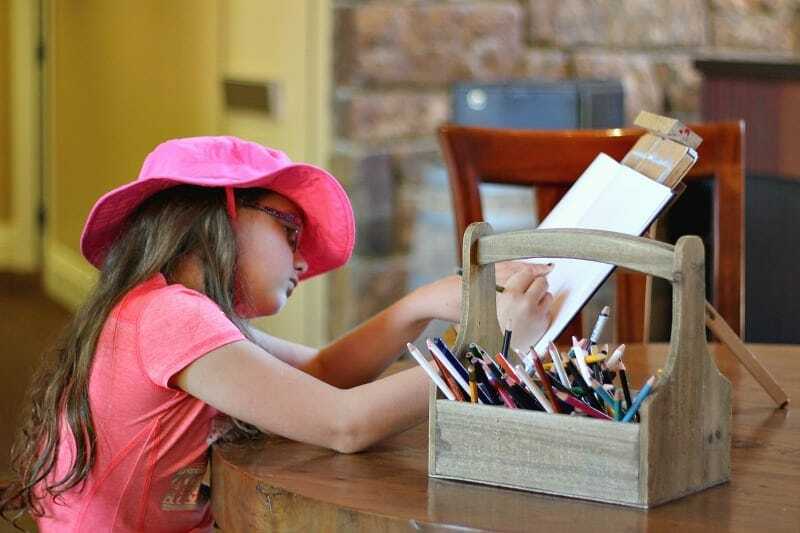 Creative Fun – One thing I noticed about Alderbrook is that the arts & creativity is encouraged here as I found multiple places around the resort where they would have sketchbooks and pencils available for little artists to doodle or easels set up for drawing. 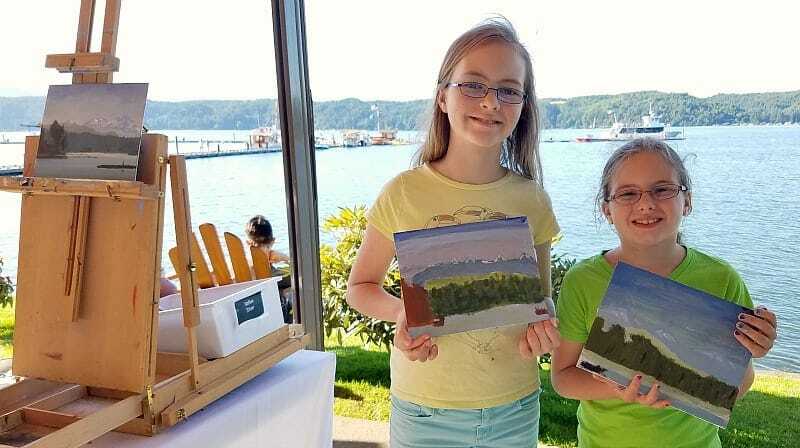 When the weather is warm enough, they also offer a watercolor painting class out on the lawn right in front of the beach once a week (on Thursday evenings when we were there). We were excited we were there on the night this took place. They had an artist teach the class & my girls learned how to mix watercolors & paint the gorgeous scene right in front of them. This is a complimentary class for those staying at the resort & such a nice memento to take home to remember your stay & those incredible views. Game Room – They have a special XBox game room with 9 individual game stations which had an XBox 360 and a 37″ tv for each station. There was also a bigger station with an XBox Kinect & a 55″ tv. Kids & adults will love this room & it’s open 24 hours/day, you’ll just need to check out the games from the front desk. My girls were excited about this game room as they normally get rare time on video games so it provided a nice, little break from the sun in the middle of the day & a chance for me to sit just outside the room on the couch & read for some relaxation time too. Win-win in my book! Spa – if you’re needing some pampering time during your visit, Alderbrook has a full-service spa right next to the pool & you can schedule a pedicure, massage, facial, and more. They offer heated basalt stones, Herbal-infused steam room, marine algae, sea brine & aloe wrap & more for some unique spa services if you’re wanting to splurge. The resort also offers an exercise room next to the pool as well so you can stay on your exercise schedule after eating so much of the yummy food. Lobby Time – I love resorts where it just feels so comfortable to hang out in the lobby & relax and the Alderbrook lobby is definitely a cozy place to hang with your family. They had tables scattered around with games such as chess & checkers & the art supplies so you could spend time together on an activity or sit in front of the fire with a good book on a winter day. I just loved relaxing in that quintessential Northwest room with the large wood beams & big stone fireplace and gorgeous views of the grounds & water beyond. 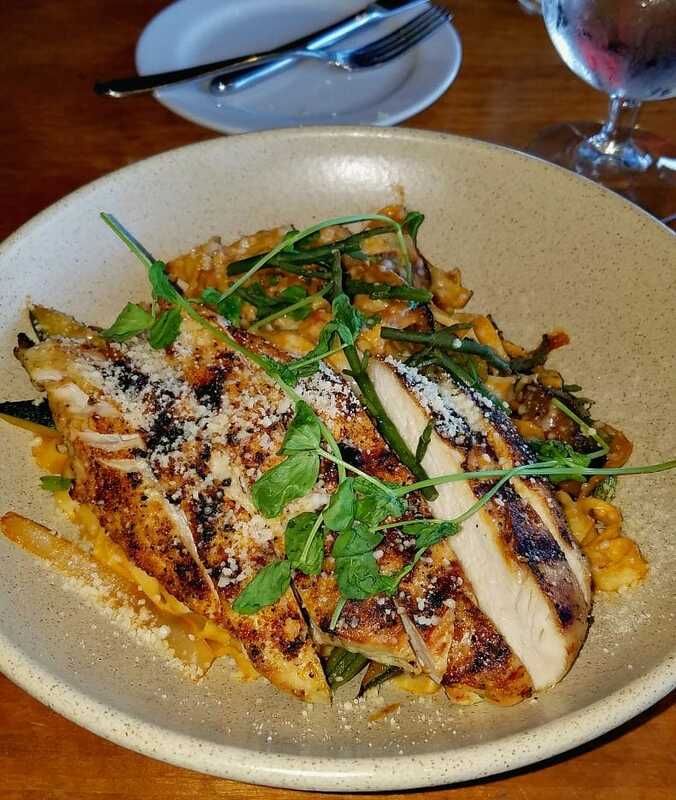 Alderbrook Restaurant – Alderbrook is well-known for their locally-sourced, regional Northwest fare at their restaurant on site. It’s a great opportunity to try out some new seafood dishes or their handmade pasta if you’re wanting a fine dining experience. The portions were very filling & the food was so fresh & flavorful. They do offer breakfast, lunch & dinner for fine dining and during the summer, there is patio dining out by the beach available on weekends, offering burgers, salads & sandwiches if you’re looking for lighter fare. You can also take advantage of Happy Hour during the weekdays if you’re looking for options to save on the food & drinks. The town of Union is quite tiny, so there are not a ton of options for restaurants, but the town of Hoodsport is just about 20 minutes away & there are more restaurants there as well. A few we saw to check out would be the Robin Hood restaurant & pub for burgers, steak & seafood, as well as 2 Margaritas restaurant for Mexican food. The Union Square Deli is another option for breakfast, pizzas, sandwiches and wraps. .
Union City Market – this is a cute little shop filled with unique trinkets & collectibles, as well as some delicious hand-made goodies like Carrot Cake popsicles (these were amazing! 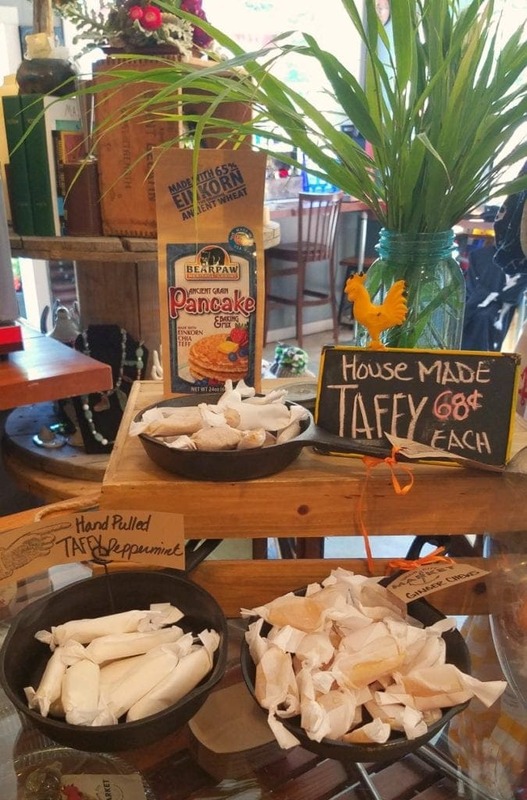 ), homemade caramels & more. This would be a fun place to pick up some picnic foods like wine, cheese & crackers for a little lunch back at the resort or on a hike. Union Country Store – this little store is the only grocery store we found in town, but it has the necessities if you want to bring a few things back for snacks or meals if you’re staying in the cottages (we got milk here for breakfast) . They also serve breakfast & lunch items (we got sandwiches to bring with us on our way out of town) as well as delicious ice cream. 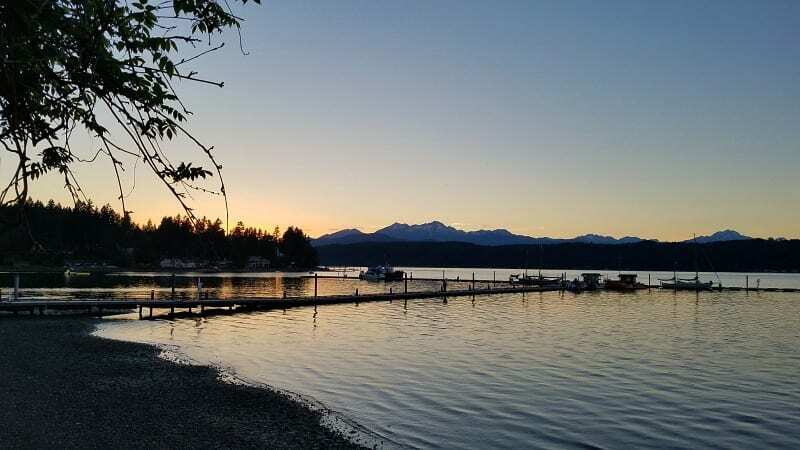 The town of Union and Alderbrook Resort is really very centrally located right at the southern end of the Hood Canal and just 20 minutes or so from the town of Hoodsport. There are a number of fun spots to head with your family for a day trip if you’re ready to explore beyond the resort for a few days. 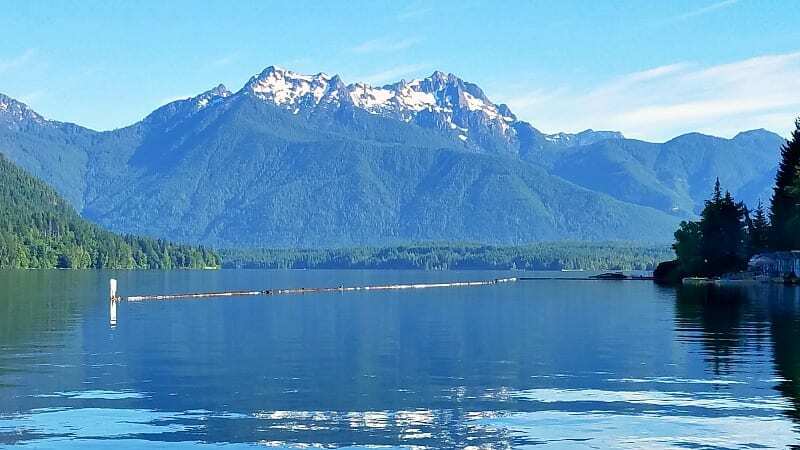 Lake Cushman – We headed up to this lake for a visit after staying at Alderbrook & this is definitely a must-see if you have a few days to visit the Hood Canal area. The lake is such a beautiful blue color & Mt Rose, Mt Ellinor & Mt Washington are all situated at the end of this lake, so the views are incredible. It is a very cold lake, but in the summertime, it’s perfect for a refreshing swim. There are places you can stop along the road if you head towards Staircase Olympic National Park or pay a fee to go to one of the day use areas at one of the campgrounds to swim. 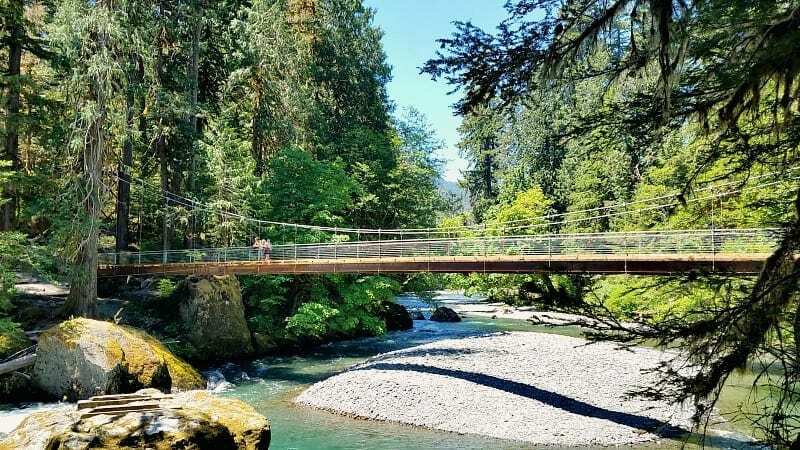 Olympic National Park – It takes about an hour or less from Union to the Staircase area of Olympic National Park, but this is a hike that is so worth it if you’re looking for a family-friendly hike. Staircase is a popular spot to head to as it is the starting point for many hikes around this area, whether you are looking for a good workout heading up the mountains or just want a family-friendly, 2 mile hike along the river. We explored the Staircase Rapids hike, which was a nice, flat 2 mile loop along the rapids of the Skokomish river. The views are breathtaking as you explore along the river, though, listening to this rapids & mini waterfalls along the way. Alderbrook Resort is an upscale resort with just 77 guest rooms and 16 cabins, which keeps it feeling so peaceful & tranquil due to its smaller size, but with that exclusivity, it can be more costly for families to stay for longer, so we’ve come up with some ways to save on costs during your visit to Alderbrook. Stay during the off-season – Alderbrook has such a gorgeous location right on the tranquil water that it really would be beautiful to stay during any season, even in the rainy weather. 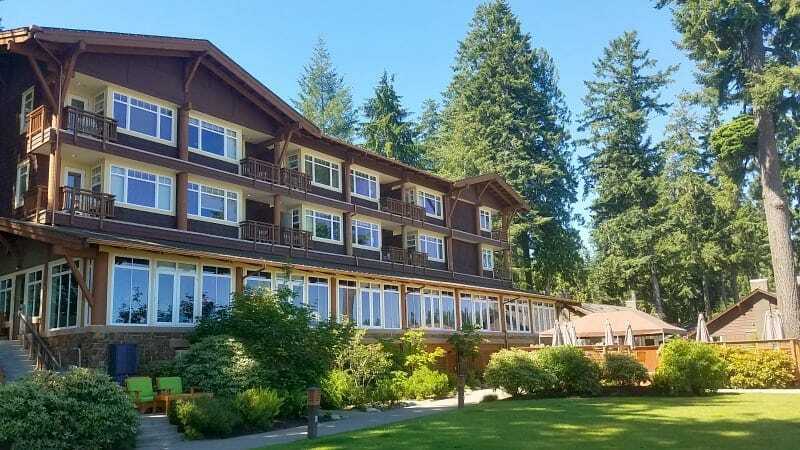 The fall, winter, and spring would definitely have more availability in rooms since Alderbrook is such a popular spot to visit during the summer & you might find more discount offers as well. Staying during the week Sunday – Thursday is another way to find savings on your accommodations as they may be offering discounts for multiple days during the week & more even during the busy summer season. Sign up for their emails & follow them on their Social Media Accounts – I always highly recommend signing up for emails for the resort location you want to visit ahead of time as you never know when they might have more availability & offer specials or packages to their email subscribers first. They also can advertise specials only for their social media customers too. Make sure to follow Alderbrook Resort on Facebook, Twitter and Instagram. Check out the Packages & Specials page on Alderbrook’s website – see if there are any last-minute offers or packages where you could save by bundling the accommodations with the activities you are wanting to do while at the resort. For example in June, they had a special for “Stay 1 night, get the 2nd night 1/2 price” as well as select dates discounted for July. So, keep checking their website for current discounts or give the resort a call & ask about the packages & specials they are offering for the time you will be visiting. Special Discounts – Here are a few of the special discounts offered for military, AAA members, AARP members & more. Bring your own snacks & breakfast foods – One way we like to save when we head to a resort is to find out if the resort has a fridge & if so, we may bring our own snacks as well as breakfast food. They serve a delicious breakfast at the resort, but if you want to save on a meal or two, bring cereal, milk, plastic silverware & paper bowls for a quick bite to eat. You could also bring snacks, drinks or sandwich fixings to keep in the fridge for any adventures during the day. If you stay in a cottage, you can definitely save on food costs by cooking your meals in the full kitchen of the cottage. Bring groceries with you or visit the little general store there in Union where you can pick up groceries for your meals. We’d love to hear your favorite tips for visiting Alderbrook Resort! Do you have any favorite activities or places to go that we’ve missed? What is your favorite thing to do while staying at the resort? 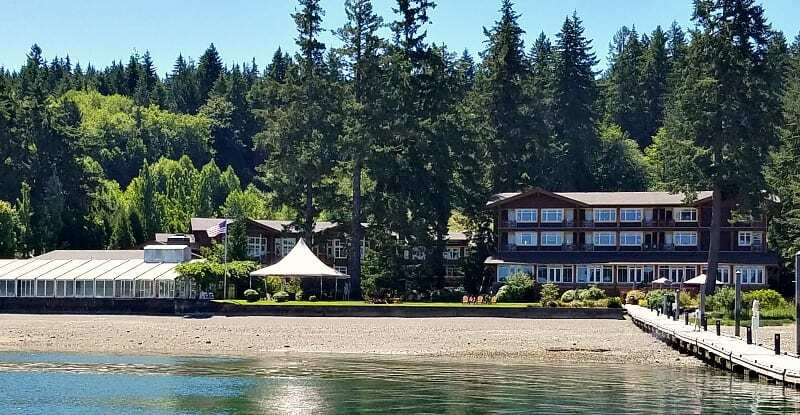 Disclosure: We were provided lodging at Alderbrook Resort to facilitate my review; however, these are all my own opinions and thoughts of the resort & area. Oh so fun! I was actually just telling someone yesterday that Alderbrook is my favorite PNW getaway!!! We had a lovely time there a few months ago! Loved following your experience too! It really does have all the elements of the total NW experience, that’s for sure, yet so relaxing! Such a great place to go back to year after year! Love this place and had no idea WSU grads could get a 15% discount. Thanks for sharing! !